Illustration by Sara Samuelson. Her article is in the Members Section below. We have reached the beginning of a new year with an important task ahead; the election of a new board and committee heads. You will see we have a head start on filling many positions, but don't be shy! If you are not certain just what would be expected, I gleaned some information regarding the positions from an insert in a newsletter from 1991. Check out the nomination section below. Add your name to the list for any position by emailing any member of the board. We will send out a ballot for online voting in two weeks. The upcoming Convention Center exhibit with GNSI and PNBA will be an ongoing feature of 2013. Sharpen your pencils, and dust off your drawing table. Before you know it we will be announcing the call for entries. This is a wonderful and rare opportunity to make new work that will be shown during the Flower and Garden show, an event that historically been attended by 60,000 people. Those interested in being part of organizing this event are invited to the Joint Exhibit Committee Meetings. 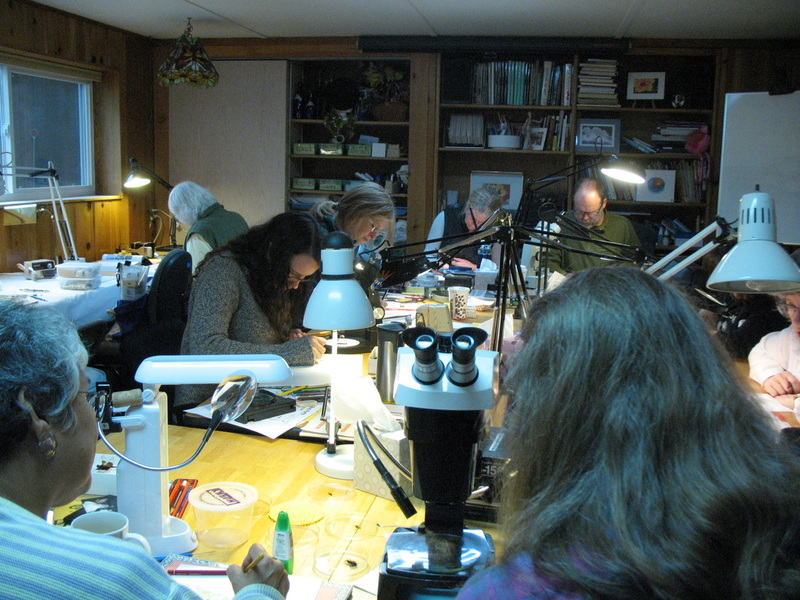 Other highlights of 2013 are four workshops currently in the planning stages, and as we are conforming to a set calendar, you can already reserve the Third Saturdays in January, April, July and October for GNSI meeting workshops. This is my 10th year as a member of GNSI Northwest. I first encountered this talented group at the demo table at the Northwest Flower and Garden Show in 2003. I never dreamed I would volunteer for a board position with this amazingly talented group of artists, I simply felt joining the group would be a good way to learn more about this type of illustration. In 2009 I became Co-President with Audrey Miles Cherney, which enabled Audrey to devote herself to the effort for our guild to host the National Conference, while I concentrated on organizing our local events. With lots of help from the devoted people who keep this organization going, we held eight workshops, the Flower and Garden demo table, and the last Traditions exhibit in 2009 and 2010. Earlier this year, our webmaster Jennifer de Mello e Souza and her family decided to move, and she began looking for someone to take on the website updates. I considered how that position could actually facilitate the work of a president or workshop coordinator, and made the decision to volunteer to be acting president for the remainder of 2012. In doing so I built upon my experience gained in 2009 and 2010, learned to make website updates and set up workshops and activities for the remainder of this year. Now it is time to pass the torch and encourage each of you to volunteer in some way for this great group. If every position is filled, we can continue the momentum, and have a lot of fun together. It is true that stepping out of one's comfort zone leads to a much richer life experience. I have appreciated the many emails of support I have received. Thank you! The board descriptions with some nominations are below. They are a variation of a insert gleaned from a 1991 newsletter. The current board recommended a period of two weeks for nominations and to finalize the ballot, and two weeks for voting via email. Our Secretary Jeanne will tally the votes. What the By-laws say: The President shall be Chairperson of the Executive Committee, shall preside at meetings of the GNSI-NW and shall have the powers and duties usually appertaining to such office with the exception of those assigned by this Constitution to the Executive Committee. What this means: The president keeps things running smoothly, can always have the board meetings at home (very handy in winter), and can expect the board to back him/her up at all times. The president can delegate much of the work, but does run the meetings. Experience has shown that we all function better when we know there is One at the Top. What the By-Laws say: The vice president shall act in place of the President when absent, be Vice Chairperson of the Executive Committee, shall become President in the event of the resignation or disability of the President, and shall assist the President in the performance of the presidential duties. The Vice President shall coordinate the quarterly meetings. What this means: The vice-president attends meetings and is always up-to-date on what's going on. The vice -president functions like a regular board member) i.e. coming up with ideas for meetings or articles, setting up meetings, writing articles, etc.) except if he/she needs to take over for the president. Here is what the By-laws say: The Secretary shall keep the minutes of all GNSI-NW meetings and is responsible for reporting this information to all members. The Secretary will handle all correspondence at the direction of the Executive Committee. What this means: The secretary usually is the main key holder to the PO Box, and makes sure all the mail gets to the necessary people. This person also notifies all the board members of upcoming meetings and keeps track of proceedings. Lastly, the secretary sends out information to new and prospective members. What the By-Laws say: The Treasurer shall be responsible for the funds of the GNSI-NW, issue and pay bills which have received the approval of the Executive Committee, maintain a bank account in the name of and to the credit of the GNSI-NW, report annually to the members , and shall keep complete records of the business of the GNSI-NW so that the financial conditions of the GNSI-NW may al all times be readily ascertained therefrom. The account shall be subject to annual audit of so desired by the Executive Committee. What this means: actually it means exactly that. In addition, if our local chapter is running a national GNSI event, such as the Summer Workshops or the Annual Meetings, the treasurer must keep track of those monies separately, most of which go to the national GNSI. The person who fills this position will always have access to help from previous treasurers , if desired. No, you will not be alone. 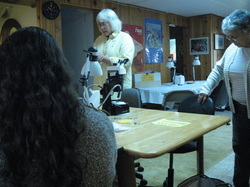 I wish every GNSI and PNBA member could have attended Wanda Booth’s October 20th, 2012, lecture on insects and bugs. Those who were able to reserve a seat fit nicely into the teaching studio of Sheila Theodoratos, located in Shoreline. Wanda’s love of insects was infectious and we were full of questions. She provided hand-outs and explained her printed information describing the phylum Arthropoda. It is made up of invertebrates: they have jointed legs, an exoskeleton and their bodies are divided into segments. Some of them have elytra, the hard covering over wings (lady bugs). The phylum is mostly made up of insects. Insects are distinguished from the remaining members of the phylum by their number of legs—insects have six. We also learned about the different wing configurations—insects have one or two pair which either lay flat along their back (fly) or stick out (dragonfly). Their feeding methods are piercing/sucking (mosquito), sponging/lapping (fly) or biting (have mandibles such as grasshoppers and ants). Wanda generously provided dissecting microscopes made by Bausch and Lomb so we could view our specimens in 20 to 40 times magnification and then draw them. She also brought one inexpensive scope that had 10 – 15 times magnification; it cost around $60.00 and we were very impressed at its usefulness. Good places to find used lower costing scopes are Craig’s List and the UW Surplus Store. We learned that a butterfly’s body is made up of three parts: located in the head is the brain, a butterfly has a circulatory system which includes a heart, located in the thorax. All legs and wings extend from the thorax. They do breathing/moisture release through small openings along their abdomen called spiracle. Reproductive parts are housed in the abdomen. The workshop ended with participants walking around sharing drawings and looking at each others specimens at up to 40 times magnification. Wow! Here is an excerpt from the article: Walking past the stone sculptures of Buddhas, and a rampant billy goat, turning left at the clochan, I approached a team of young masons working on what will become a medieval European village. They were assembling a course of rock on the ground, and then handing up each rock in its predetermined order to the mason high up on a wall, which was three courses deep. "Back in fall of 2010, I had an exciting opportunity to become an Artist in Residence at the Huyck Preserve. The preserve is located in the charming small town of Rensselaerville out-side Albany, New York. The preserve's residency program, called COMmunity.ENvironment.ART Natural History Artist-in-Residency, has clear goals for their artists. They request that the artist-in-residence create a piece of work that gives back to the community, educates the public about science and environment, and expects an artist to immerse themselves into their science and natural history. During my stay I was able to dive into their research, gather inspiration from the forest, and had the luxury of spending my time creating illustrations based on science. My work focused on researching and illustrating the ecology between the Northern Red Oak and local weevils. The piece I created will be used by the preserve in educational materials with the hopes that it inspires the public to take a closer look at their local environment. Being a young science illustrator, opportunities like this residency, are a great way to meet scientists, get exposure to the public, and gather unique experience that can be used to inspire creative illustrations. I am excited when I discover opportunities similar to the one at the Huyck. It is experiences like this which will help me become an even more successful science illustrator. http://www.huyckpreserve.org"
David Ehlert’s Cognition Studio had a solo show entitled "*code assemblages of knowledge transfer " at the Columbia Basin College's Esvelt Gallery in Pasco, WA, from Nov. 5 - Dec. 6 with an artist talk on Nov. 8. Here's a brief on the theme: *code is something we all live by. It's also a means by which we store / transfer / translate / communicate something from one form (at) into another. For Cognition Studio, our code is to educate and create knowledge transfer through our visual solutions. The gallery images - serve as samples or case examples of our code and are represented through our graphic design, information design, and medical illustration." Susan was accepted into the "Seattle Sketchbook Show" to be held in the Steele Gallery at Gage Academy of Art April 5 through May 3, 2013. The sketchbooks are provided to the accepted participants who sketch over 5 months’ time. Select pages from the sketchbooks will be enlarged in the gallery and select sketchbooks will be digitized and viewable online. Susan completed her "Introduction to Natural Science Illustration" class in December for the University of Washington's Extension Program last fall, and will be teaching Botanical Illustration for the Program in the spring. Susan has also been the leader of a growing informal gathering of artists who meet weekly on Tuesdays at Third Place Commons in Lake Forest Park. She was honored for being an outstanding Commons Creative at the annual fundraising breakfast on February 14, 2013. And it doesn't stop there... Susan conceived and organized an Ink-In, a totally free weekend arting event "for people interested in pen & ink drawing, painting, calligraphy, markers, basically anything inky." The first one was held on Saturday, November 17. The art making people who attended filled 5 tables. The event is now continuing on the first Saturday of each month for all kinds of art-making, not only ink. "Come make art at this free, drop-in creative time for drawing and painting artists - bring your friends and/or make new ones! There's no instructor, just plenty of community art-making. BYO art supplies/all levels of experience welcome! *No oil paints/solvents, please! * Look for the plastic-covered tables in the Commons. In Lake Forest Park Towne Centre at Bothell Way NE & Ballinger Way NE. "